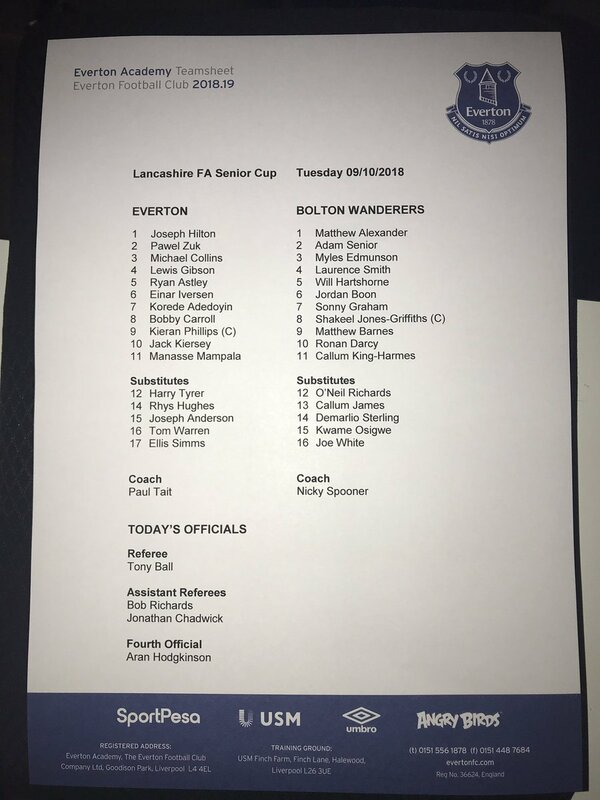 Bolton Wanderers U19s take on Everton U18s(?) in the First Round of the Lancashire FA Senior Cup on Tuesday 9 October. Everton fielded a mix of U18s and U23s at Rivacre Park, Ellesmere Port, that are probably all Under-19 to match their opponents. Everton had had a number of chances before Korede Adedoyin got his head to a finely delivered free-kick from Jack Kiersey, powering it home for the opening goal 5 mins before the break. Everton made it two through Kieran Phillips, as he is played through one-on-one with the Bolton 'keeper and places the ball underneath him. At the death, a fine ball crossed in by Adedoyin was converted by Ellis Simms to make it 3-0. Everton U18s: Hilton; ZUk, Collins (76' Warren), Gibson (73' Joe Anderson), Astley; Iverson, Adedoyin [Y:55'], Carroll, Phillips (61' Simms), Kiersey [Y:73'], Mampala. Subs not Used: Tyrer, Hughes. It's a cup competition so don't expect us to take it very seriously! 3' An early chance for the Whites, with excellent closing down play of Everton goalkeeper Joe Hilton nearly had Ronan Darcy in with a chance on goal! 6' With Shakeel Jones-Griffiths getting caught on the ball, Everton captain Kieran Phillips was allowed space to run into in the Wanderers penalty area, but could not fashion a shot. 8' Everton have their first chance of the game with a corner, but even with the glancing header, it was never troubling Matthew Alexander in-between the sticks. 14' Phillips has another chance for Everton, this time with a free kick. However, he couldn't convert the chance as it flies over the crossbar. 16' Bobby Carroll nips in infront of his man to drive into the area for the Toffees, with his effort blocked out for a corner. The following corner came to nothing as Manasse Mampala skied over the eventual effort on goal. 25' Another driving run down the left flank for Mampala, but Whites skipper Jones-Griffiths was there all the way as he intercepts wonderfully. 27' Free kick to Wanderers in their own half after Mampala fouled Adam Senior. Good quick feet from the full-back to evade his man! 36' Blues winger Korede Adedoyin nearly had the home side in the lead, as he whistled a curling right-footed strike from the edge of the area just wide of the mark. Alexander could have done nothing! 39' GOAL! Freekick to our opponents in a dangerous position on the left. Kiersey loops the ball into the area and Adedoyin rises highest to stick Everton in the lead. 43' The home side nearly made it two. A dangerous driven cross into the area found the head of Phillips, but he couldn't direct his attempt goalwards. 44' Bolton had a reply to the Everton pressure, with Senior producing a ball into the area, finding Matthew Barnes in the air. Unfortunately for the Whites, his header couldn't find the equaliser. Phillips getting the second, going round the goalie in a one on one and slotting the ball into an empty net. 50' Jordan Boon goes into the book, after a late challenge on an Everton forward. 52' Now Shakeel Jones-Griffiths picks up a yellow with a late challenge in the centre of the pitch. 55' Korede Adedoyin is in book for the home side now after a late challenge. Tackles are certainly flying in here! 56' GOAL! Everton make it two through Phillips, as he is played through one-on-one with Alexander and places the ball underneath the onrushing goalkeeper. 60' A big chance for Darcy! Everton try to play it out from the back, but the forward intercepts and has a effort from 10 yards. But, his effort is off target. So close for the young striker! 62' A cross fizzes across the Wanderers penalty area, finding the feet of Simms. However, the substitute couldn't guide the ball on target with his flicked effort. 63' Adedoyin nearly had his second of the evening. A thunderbolt strike from the 18 yard box saw Alexander rise high to his right to palm the ball over the bar. Certainly one for the cameras! 70' Korede Adedoyin is causing some trouble for the Whites tonight. This time, cutting in from the right and driving into the space before unleashing a powerful strike on goal. His effort wasn't far from the target for Everton. 73' A yellow card for Jack Kiersey after another late foul in the centre of the pitch to stop a Wanderers counter. 78' Matthew Barnes with a surging run down the left side of the Everton half, beats two men before hitting a shot on goal which flashed past both the keeper and the far post. Ever so close! 85' Another fantastic save from Alexander, this time from Everton's Ellis Simms. A curled ball into the area found the Blues second half substitute as he headed it towards goal but the Whites keeper made a terrific diving save to his left. 88' Another chance for Darcy! After a defensive mix-up for the home side, the ball fell to Sterling. He played in his striking partner, but his well hit shot on goal from just inside the area couldn't find the target. 90+1' Another chance for Bolton! A deflected cross looped up into the air. Jones-Griffiths was first to react to it, but his header was diverted out for a corner. Five minutes added on here in this one! 90+3' GOAL!!! Everton seal the win with a superbly floated Adedoyin cross into the danger area that found Simms who scored the third for Everton. I followed the match on the Bolton site too, we just seem to be getting worse as a club for reporting our U18 & U23 matches. While I'll accept the match wasn't that important, seeing Gibson starting is good news, it looks like he was alongside Astley at centre-back, Collins-left back. It looks from the reports that Adedoyin had a fine game, a goal and an assist. Another who's coming back from injury and picking up his game. He offers a bit more skill than Simms or Mampala who are perhaps more physical. Simms is certainly banging in the goals too. Rochdale away in the quarter-final. Absolutely, Phill, good to see Lewis Gibson on the teamsheet.